Before I sit and meditate in the morning, I like to perform some basic stretches to feel less stiff and get the blood flowing in my body. It is very important to start the day connecting your mind and body so you can act with complete intention as you walk, eat, work and communicate. I start standing with my legs together and feet evenly planted into the ground. Engaging my core, I place my hands in a pray position near my heart. I take a deep inhale as I raise my arms out to the side and circle up to reach the sky. Then with an exhale, my arms circle back down to prayer position. I repeat this exercise about 3 times so I feel length in my spine and limbs. This small movement also allows me to become aware of the power of my breath. Feel yourself stretch and lengthen. Next, I cross one leg over the other so the sides of my feet are touching. I again, perform this same circling position with my arms, but this time, with my exhale I dive my head to the ground--reaching my hands to the floor as I bend over. This stretch lengthens the hamstrings, calves, lower back and neck. Hold this stretch for at least five complete cycles of breath before slowly re-stacking the spine, curling up one vertebra at a time and placing the hands back in pray position. This stretch may feel especially intense since our bodies are extremely tight and stiff in the morning. 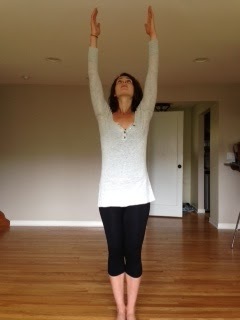 Repeat this exercise by crossing your other leg and maintain it for those same five deep, slow, and controlled breaths. Try to stick with your deep breaths and feel how much deeper you melt into the stretch with every exhale. After I complete this series, I sit on the floor cross-legged preparing for another stretch to awaken my spine and core. Inhale to prepare; exhale, placing the left forearm on the ground, stretching to the left while the right arm reaches over your head. Keep in mind that the right hip stays planted into the ground. 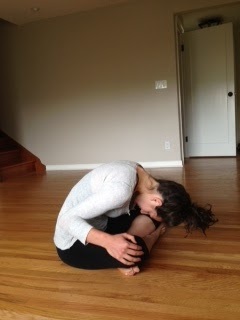 You will feel this stretch in your rib cage, lower back, shoulder and neck. It is important to hold the stretch for at least five breath cycles in order to allow enough oxygen to enter your body and release some of the morning tension. On my last exhale, I bring myself back to center where I inhale and then exhale as I drop my right forearm on the ground reaching over my head with my left arm. This time, I stretch my left side while keep my left hip on the ground. Holding for five breath cycles, I then exhale to bring myself to center. 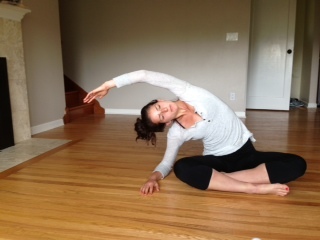 Remember to keep your opposite hip glued to the floor so you feel that deep side stretch. 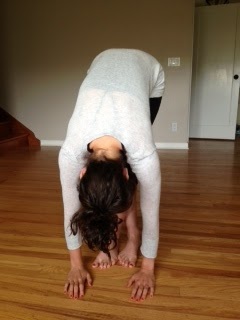 Next, I focus on the forward and backward bending motion of the spine. Inhaling, I grow tall, exhale, and move my chin to chest as I curl down one vertebra at a time. I allow my head to fall into my lap. I inhale as I hold the stretch and then my exhale allows me to engage my deep core and re-stack one vertebra at a time as I sit even taller, back into my starting position. Moving backwards, I place my hands gently on my knees as I inhale to prepare, exhaling, I reverse the movement and tuck my tailbone under, curling back one vertebra at a time. This creates a "C" curve with the spine. Inhaling while holding the stretch, and exhaling, I engaging the core as I un-tuck the tailbone--re-stacking the spine, feeling even greater length through my spine as I come back to center. I do this whole sideways, forward and backward stretch cycle three times in order to feel awake from my inside out. Keep that tailbone tucked under and tension out of your neck. I complete these morning exercises by sitting cross-legged and recharging with at least 5-10 minutes of Mindfulness meditation--making myself mentally and physically stronger for the day! Challenge yourself and try this morning routine for a week to see if you feel mentally and physically stronger!